Happy Monday! I had a fun (but exhausting lol) weekend. My brother, best guy friend, and some of Kyle’s family were in town so we were more active then our usual weekend 😉 Friday we had lunch in the design district which I’d never been too (def going back to explore), hung at the pool all day then went to Truck Yard (so fun!) that night. Saturday we hit up the fair and went to the OU/Texas game! It was so much fun and I think we literally tried half the food there…we all felt a little heavy the next day lol. It was SO hot Saturday but the temps dropped yesterday and it feels amaaazing. I never thought I’d pray for cooler weather ha! I got an Autumn Cashmere sweater for Christmas last year and LOVVVE it. I was so excited when they reached out to see if we wanted to pick something out for fall. Their sweaters are definitely investment pieces but you can’t beat the quality. And not to mention, they are SO soft. How cool is the laced back on this sweater? I’m OBSESSED and can’t wait to pack it for my trip to Utah this weekend! 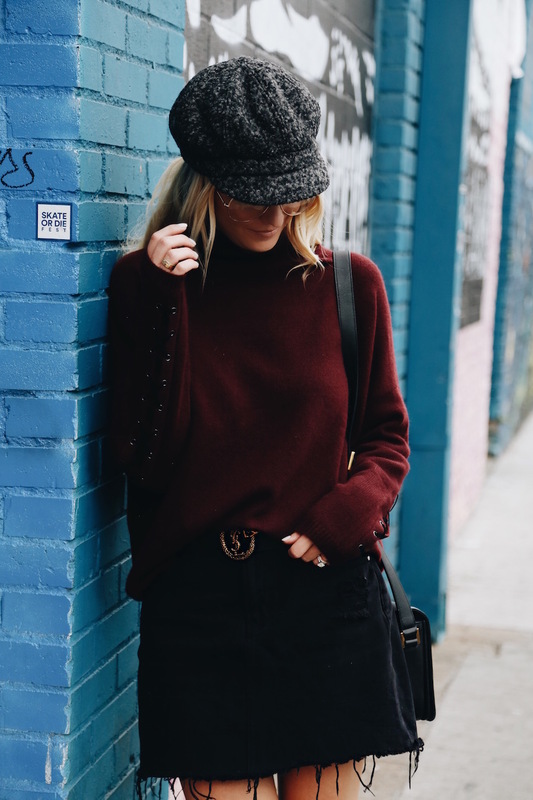 I jumped on the newsboy cap trend and think it’s so cute. It’s a fun change up from a beanie or fedora. Shockingly, Kyle even likes it! This one is under $50 and comes in three colors! It’s safe to say I’ve been living in these booties since I got them. Brooke just got the leopard pair (see them here) and I’m so jeal. They’ve been on my mind for awhile sooo I just might have to pull the trigger. Obsessed with this look!! SO good!